The Pensacola State volleyball team moved to a 17-2 record when the Lady Pirates dominated Andrew College in a doubleheader on Monday in Hartsell Arena. The Lady Pirates are 1-0 in Panhandle Conference play, and the team is scheduled to meet rival, Gulf Coast Community College, at 6 p.m. Wednesday in Panama City. Pensacola State is ranked No. 9 by the Florida College System Activities Association. On Monday, the Lady Pirates defeated Andrew College 25-19, 25-12 and 25-20 in the 2 p.m. game. Scores for the 4 p.m. game were 25-14, 25-15 and 25-10. Teams must win three out of five games. Y’Tae Cobb, a Pirate middle hitter, is leading the NJCAA in hitting percentage at .477. A freshman, Cobb is from Muscle Shoals, Alabama. Sophomore Iyaria Walker is eighth in the NJCAA in hitting percentage at .395. A middle hitter, she is from Houston, Texas. Sophomore Hannah Fromdahl (Mobile) is 17th in assists per set, and sophomore Kaitlin Grote (Coral Springs) is 29th in assists per set in the NJCAA. Other team highlights include being ranked in the Top 20 in hitting percentage, service aces, service aces per set, block assists, total blocks, total points and finally points per set. 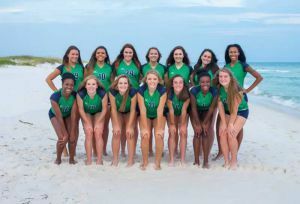 Chris Laird is the Lady Pirates’ head coach, with former Pensacola State volleyball standout Jasmine Middleton as assistant coach. Chad Fuller and Cliff Ragsdale also serve as assistant coaches.